The air conditioner's air compressor system was installed on day 64. The lines for the refrigerant and electricity were pre-wired to the outside of the house during construction for an easy installation. The compressor is set upon an ABS plastic base that not only keeps the unit off of the ground, but will not rot, crumble or erode over time, leaving an even and level surface for the unit. As you can see from the photos above, the electrical panel connects to the compressor inside a piece of exterior grade shielded conduit. The coolant line is insulated to prevent transmission losses as much as possible. Air conditioning units are beneficial, especially when it is scorching hot outside. Whether you are resting in your home or riding in your car, air conditioning units are definitely beneficial during the hot summer months. Do you actually know what happens inside the compressors of your air conditioning units that produce the cold air that gives you relief? To give you an idea, read on. 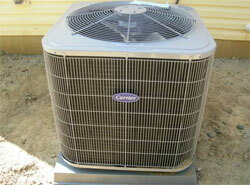 Air conditioning compressors are the "black box" units that you see inside your air conditioning units. They are called this because they are typically clad in a casing with a black color. One thing you must know about air conditioning compressors is the fact that their features may also have slight to great variations depending on their types. Here are some of the features that can be found in the different types of air conditioning compressors. One type of air conditioning compressor is the axial compressor. This type actually does a clockwise rotation. One feature of this compressor is the individual airfoils. You will recognize these as the blades that actually look like small wings. Actually, this type of compressor is very efficient. Another type of compressor is the so-called vane, also called the rotary vane compressor. This one is fully equipped with a rotor, which rotates. You will recognize this type of rotor in that it has various blades, which can be found within radial slots. Thus, when the rotor begins to move, you will see that the blades are continuously moving in and out of these radial slots. Like the axial compressor, the vane compressor is also considered very efficient. The scroll compressor is also another type of compressor for air conditioning units. In fact, it got its name from its features-two spiral vanes which are actually connected to one another and they look like scrolls. One of the scrolls is stationary. On the other hand, the other one is doing a clockwise movement. Finally, there is the centrifugal or radial compressor. For its part, this compressor functions through its rotating disk feature. However, one drawback to this compressor is the fact that it creates friction inside it, which lowers down its efficiency. Regardless of what type of air conditioning compressor you look into, all compressors should have the following features. For one, it should have a pressure rating. This is actually the maximum pressure point wherein the compressor will not be able to support the rising pressure any longer. At this point, there will be a backflow of the refrigerant that has been compressed. In the same manner, all air conditioning compressors should also have a flow rating as well as a speed rating. Finally, another feature that you should look into when it comes to air conditioning compressors is efficiency. The best way to can get an idea about this is through the Energy Efficient Ratio or EER. If you are interested in choosing an air conditioning compressor that best suits your needs, contact your local air conditioning repair company.